Someone at the swallowing clinic actually read my questionnaire responses! They called me! They really called me, and talked to me about my strange predicament! The woman that I spoke with, has never heard of a "food in my throat situation" quite like mine. So this is a summary of what she had to say...when it happens, try to breathe through my nose. Relax. Deep breathes through my nose...I can try to "trick" the reflex in to going again with a bit of liquid, but not much, because that could backfire (as it has!). I can set up a signal with anyone that I am eating with to rub my back, and help me relax...but no fancy maneuvers as I am not YET choking. At the end of our conversation, I asked one more question..."Is this my MS"? Her response was that with MS, as we know, there can be "spasm" like reactions, and mine just happens to be in my throat...that will be "my thing". Let's hope that she is wrong. 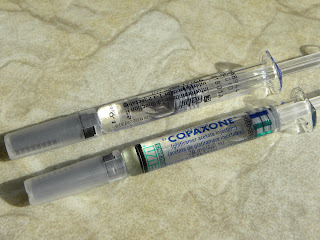 For some time now (well over a year) I have intended to take pictures of the Rebif (22mcg) and Copaxone pre-filled syringes. I know that you have been just itching to know what they look like. I have shared my pre-shot, during-shot, and post-shot reactions with you. You have heard about tears, seen pictures of welts and red marks, and you have read about how these darn needles can cause stress for the whole family. I have let you know when I've found needle disposals in public washrooms, and when I was once able to shoot-and-go at the Rogers Center in Toronto. Ice packs, heat packs, wonderful telephone nurses, and atrocious prices for these DMDs (disease modifying drugs). Surely you must be wondering what they look like...what does poison...a clear liquid that can burn your skin...liquid gold....look like. Well now you know. 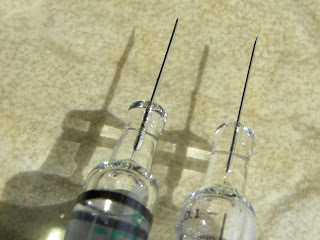 Rebif advertises a smaller needle than the other DMDs. 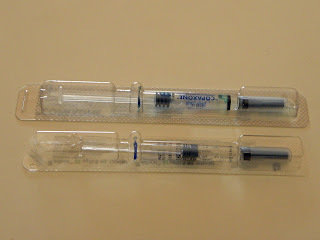 The Rebif syringe is on the right. 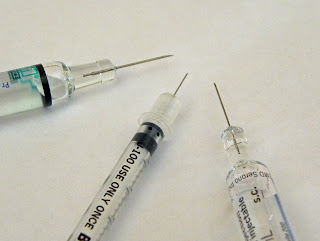 This photo is of a Copaxone needle, a needle used to inject insulin, and the Rebif needle. DMDs - the front-line treatment for MS. The MonSter is quiet today. Something isn't right in my world. I don't feel challenged. This is likely a result of not being focused on anything in particular. I don't have (and haven't had for some time) an ability to focus and concentrate on a single task. I have mentioned before that there are tasks and projects that I can do around the house, but I don't want to make a mess that I can't get cleaned up. I'm spinning my wheels. I'm afraid to venture out. I'm afraid to stay in and live. I realize that I am most likely just being hard on myself. I expect too much. But I'm saying it anyway. I know that I just took a knitting class. I know that I have spent a few hours with crafty artists like myself, exposing myself to new people. I know that I have made a few trips to Curves this month. I know that I helped to lug stone around my neighbour's house this past Saturday. My problem is with myself. On a day when I get out of bed, get out my breakfast, unload the dishwasher, have a shower, check my email...I feel as if I have accomplished nothing. I'm sure that I sound like a broken record. I'm obviously still working on being my own best friend, and not my own worst enemy. High client volume does not allow for the speech pathologists at HSC to follow up in person with all of their patients. So, they send out annual follow-up questionnaires, complete with a self addressed stamped envelope. I just finished filling my out. To sum up my responses, my swallowing/coughing situation has stayed the same. I appreciate the follow-up, and I assume that if I have increased concerns, I can connect by telephone. But I did ask a serious question: when I am unable to activate the swallowing reflex, is it okay to add liquid to try and "trick" the reflex? Surely stuffing more food in my mouth isn't the answer. Because I do wonder - what am I supposed to do. No body else seemed to think that squeezing my breast was a smart idea, so I'm at a loss. Is there another body part that can act as a "save me from this situation" button? Should I tug an earlobe? I'm not exactly energetic. Let me be real...I'm not exactly social either. I don't talk much, I don't write much. But don't confuse this with being depressed. I am busy. Knitting class, and tonight, a craft sale. I had a great time with C-Dazzle and Jay on Saturday night. I'm just being thrifty with my energy. On April 22, Earth Day, I posted a list about how I try to live green. While the list had a number of little things, it didn't include composting. I didn't take as much heat as I thought that I would for NOT composting. But don't be upset with yourself, my own guilt (and Jason's) was overwhelming enough. We are now a composting house. Our black Earth Machine sits proudly in front of our back fence (offering a distracting view away from the hot pink thong). The departure of C-Dazzle and Jay has given us a stainless steel counter top compost to collect our scraps in, before hauling them outside. *Did you know that plain rice is compostable? I have no immediate plans to quit my day job. If I had a day job, I wouldn't take any time off to feed my knitting skills. I think that knitting will remain something that I do as a side, side project. 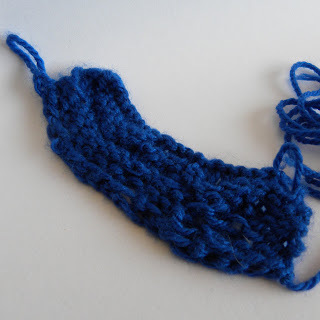 I enjoyed the class, and I have since pulled out my new knitting needles and gave it all another whirl. I'm glad that I jumped out of my comfort zone, and I'm glad that Jason picked me up afterward. I have been having some problems with my legs, in particular, when I lay down. It feels as if someone is straightening my leg...pulling on both ends of an elastic. And I find my toes curling under and in. What is confusing is that I know that I have restless legs syndrome. But when my restless legs act up, I have the urge to move my legs. They feel crampy, and well, restless. When some invisible red eyed monster is pulling at my muscles, I just want to relax my legs. Sometimes I want to give it a gentle shake off. So my question (mostly to myself, but if you have a thought, please share it) is: is this spasticity? I wake up with pain, mostly in my left leg. Does this prevent me from doing things? I suppose not directly, but it does make it harder to get out of bed in the morning. There are conflicting numbers as to how many people with MS experience spasticity. Some websites offer that 20% of people will experience some level of spasticity during their time with the disease. Other numbers include that 1/3 of all people will adjust their daily living in some way due to spasticity. What Does Spasticity Feel Like? Extensor Spasms: These happen when a limb, usually a leg, stiffens and the person is unable to bend the joint. These cause the limb, usually a leg, to jerk away from the body. It usually affects the quadriceps (the large muscles on the front of the thigh), causing the lower leg to straighten. Flexor Spasms: This type of spasm causes a limb to contract, or bend, toward the body. This type of spasm almost always affects the legs, especially the hamstrings or hip flexors. Clonus: This is when muscles jerk or twitch repeatedly. The most common forms of clonus is when a person’s foot taps rapidly and repetitively on the floor or knee or ankle jerk repeatedly after stimulation (such as tapping at the joint), rather than the normal response of one tap or jerk. Adductor Spasms: These are more rare. These spasms cause a person’s legs to close together tightly, making it difficult to separate them. Stiffness: This can be thought of as mild spasticity. While not as dramatic as some of the forms of spasms described above, when muscles are slow to relax, it can cause problems walking or using the hands and fingers to perform delicate movements. In some cases, the stiffness may not pose a huge problem. In other cases, the spasticity can cause problems with mobility or be painful enough to interfere with daily life. Tomorrow evening, I'm stepping outside of my comfort zone. Or maybe I'm embracing my NEW comfort zone. I think that it is a little bit of both. My comfort zone is to be in areas where I am familiar with the setting, or at least with people that I know. Recent experiences have shown me that if I am nervous, my MS symptoms are more likely to appear. It must have something to do with physiology. For example, if I am in a room of strangers, or with people whom I don't usually interact with, I am more likely to be nervous. Yeah, yeah...I can hear you..."I get like that". When I get nervous, I get the wobbles. I stop turning my head, and become rigid, quiet. I retreat for self-preservation. Nervousness and uncertainty are not my friend. So what is my new comfort zone? When I read what I just typed, I feel as if my new comfort zone is more of an anomaly. I am doing something that I wouldn't usually do, MS, or not. I'm participating in a 3 hour knitting class. I'm going to learn how to cast on, cast off...and something else that I can't remember at this time. I consider this to be one of the pluses of having frayed wires, and my life experience of the past 3 years...a greater ability to see life for what it is, and not be over analytical, skeptical, or reserved...just do it. Once again, I had a good little run. A few trips to Curves, venturing out in the car to pick up Jason from work, taking the bus home following my haircut, regular weeding of the garden, an evening game of Bocce Ball, and driving the car for an hour and a bit on the highway. I slept in. I dragged my limbs around. I didn't pick up the phone to call anyone. I napped for an hour and a half. I didn't eat much dinner. Predictable - to a point. I never know when I'm going to be able to cruise the city - or my own house for that matter. is this the way it's going to be...down for months...slowly get back up...have some energy during which time I try to undo the accumulated effects of a somewhat sedentary life...only to go through it again in an undisclosed amount of time?